Quick. Off the top of your head, what is the effective rate on your merchant account? If you know the answer, awesome. If not, then it’s possible I’ve got some news you might not want to hear. Advertised rates for credit card processing are very rarely the same as effective rates. Rate discrepancies are caused by merchant account providers using super sneaky tactics when marketing and selling their services. And it’s not just the shoddy companies, the best in the biz use the exact same techniques. It’s pretty much the status quo in the industry. Ever notice that it’s next to impossible to do a head-to-head comparison between two merchant account providers? This isn’t a coincidence, it’s by design. Did you do finish your homework? First, take a look at why your effective rate is important, and then once I’ve sold you on the idea of how imperative it is to monitor your effective rate every month, you can learn how to quickly calculate it right here. If you’re like many of my clients, you’ll be shocked to learn that you’re paying more for credit card processing than you thought you were. Don’t beat yourself up over it. 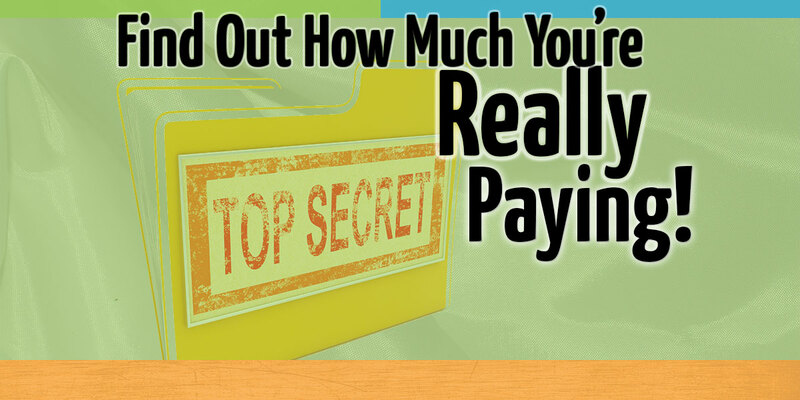 Believe it or not, most people who have a merchant account don’t know how much they are actually paying. Unfortunately, the credit card processing industry doesn’t have advertising practice standards that companies are required to abide by. With no oversight, providers simply advertise a low “teaser rate” without giving you the whole story. Rates of 1.9% or lower catch your eye, making you feel like you’re getting an incredible deal over other merchants. But this teaser rate is actually what’s known as the interchange rate. Interchange rates are established by the card brands (Visa, MasterCard, Discover), and it’s basically a fee applied on the money transferred from the acquiring bank to the issuing bank when settling card transactions. It’s simple. Providers make their money through hidden fees, monthly minimums, interchange differential pricing, exorbitant contract cancellation fees, and lease agreements on processing equipment that is cheaper in the long run to purchase outright. The bad news is that every provider employs more or less this same formula. The good news is that there’s an easy solution to wade through this ocean of hidden charges. At the risk of being repetitive, just remember that it’s completely irrelevant how your provider divides out the fees and rates. What matters is how much you are paying in total each month for a given volume of sales. Once again, this is called your effective rate, and it’s the bread and butter of merchant account maintenance. Armed with your effective rate you’ll be impervious to teaser rate ploys and know once and for all exactly how much credit card processing is costing your business. The idea here is not to shame merchant account providers for shady advertising tactics, but to drive home the point that knowing your effective rate is the simple workaround. Every action has an equal and opposite reaction. What will your reaction be when you calculate your effective rate for the first time and find out exactly how much you are paying? Hopefully you’ll be jumping for joy, safe in the knowledge that you’ve wrangled a great rate. If you’re not happy with your rate, all hope is not lost. You’ll want to consult with a payment processing professional who can analyze your situation and determine if switching to a new provider can save you money in the long run. And I know a great one…it’s me! At the very least you’ll want to read the articles on effective rate that are linked in this article. If you’d like to have a chat, Let’s Just Talk.